I have just returned from a fabulous, leisurely voyage on board the gleaming, glamorous new Silver Muse. Setting off from Villefranche, near Nice, the ship circumnavigated all around the Italian coastline to sail into Venice for a magical three day stay during the Venice Biennale. 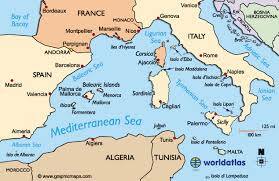 The six week itinerary covered no less than nine countries around the Mediterranean, Adriatic and Ionian Seas. Back home this week just in time to visit the Dundas Street Gallery for a new exhibition, “Tranquil Destinations”, by Jamie Primrose who takes us on a sunny Continental journey. In recent years, (amongst a diverse range of places), Primrose is renowned for his meticulous cityscapes, capturing the historic architecture of Edinburgh, but also the scenic beauty of the East Lothian where the beach meets the sea beneath a stormy sky. So where has he travelled this time? The French and Italian Rivieras – Cote d’Azur, Cinque Terre, Liguria, Provence – Tuscany and the incomparible city of Venice. 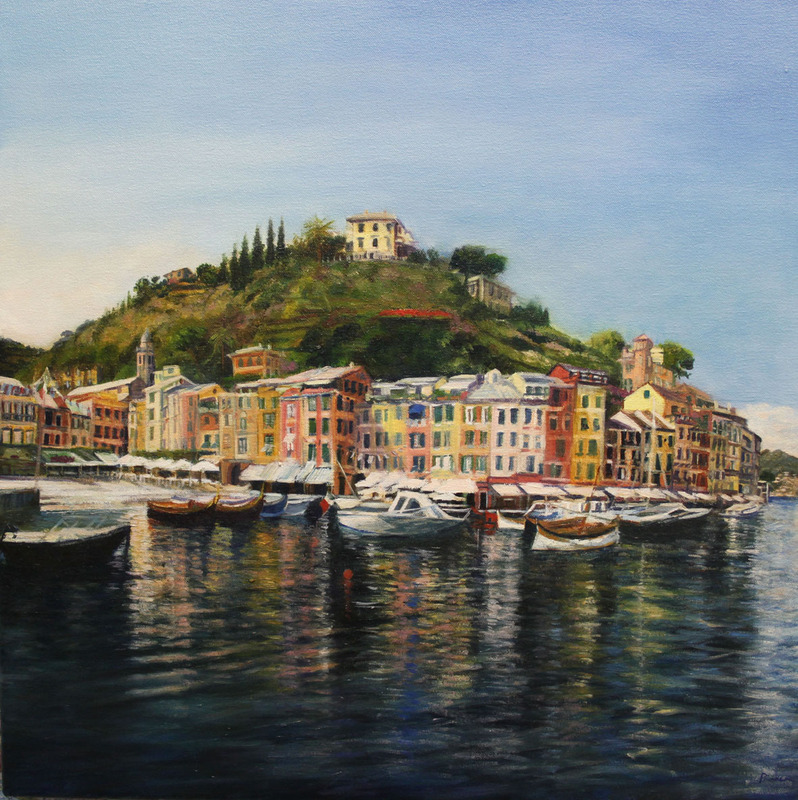 As you step through the door, one of the first paintings you will see is of Portofino, a charming town which curves around a half moon bay, the harbour lined by super yachts, motor launches, ferries and fishing boats, beside a row of shops, bars and restaurants. The soft pastel colours (ochre, peachy pink, lemon yellow) of the stonework are reminiscent of Tobermory, Mull – but in the blazing heat of the Italian sun! Having been here a few weeks ago, I was transported back to this idyllic spot, with the buzz of visitors wandering along the waterfront, stopping for a glass of Prosecco, a seafood lunch or browsing for a bag in Louis Vuitton. Jamie Primrose spent last summer with his family exploring the Ligurian Riviera while staying in Sestri Levante another delightful little town, a favourite with Milanese residents many of whom own holiday homes here. This once quiet fishing village has slowly turned into an attractive resort. The quietly composed painting, “Impressions on The Bay of Silence” neatly illustrates a scattering of anchored boats, the sweeping promenade along the beach, where at the far end, a statue of a mermaid commemorates the Danish author, Hans Christian Anderson who lived for a time here in Sestri. The coastal region of Cinque Terre winds its way through five distinctive villages, perched along the shoreline and up dramatic high cliffs. “Late Afternoon in Manarola” depicts the extraordinary shape and symmetry of sky high higgledy-piggledy houses leading up to terraced vineyards above. Heading inland to Tuscany, here too are several exquisite views of San Gimignano, the iconic town with its Medieval skyscraper towers. From the artist’s standpoint looking across a patchwork quilt of green fields, see shifting light patterns, from the clarity of early morning to the soft afternoon shadows. This artistic journey takes us around Italy to the most romantic, most beautiful city in the world, La Serenissima – Venice. With Gillian’s personal, and most informative, travelogue to hand, on my recent visit to Venice I meandered along cobbled alleys, criss-crossing a myriad of canals over ancient bridges, across flagstoned Campos lined with cafes and Ristorantes, to reach the breathtaking, never-changing sight of the Grand Canal. This majestic vision can be experienced in a series of paintings detailing in fine precision the panorama of stunning architecture along the wide waterway. Jamie Primrose spent a week in Venice, finding a perfect position on the Accademia Bridge, to capture the same view from early morning after dawn to richly vivid sunsets. He makes sketches en plein air, takes photographs and notes on the colour palette to take back to his studio to work on the final compositions. 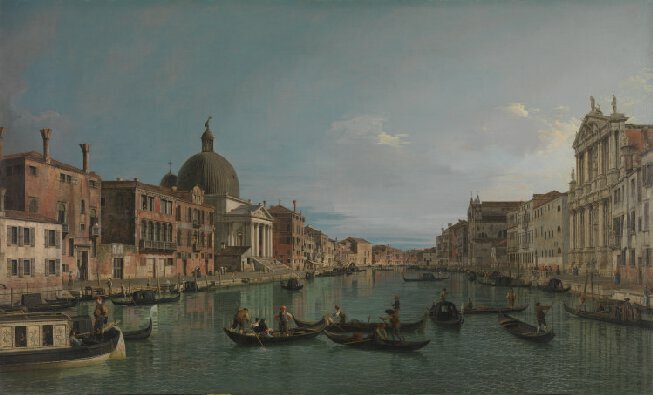 “Last Light on the Grand Canal, Venice” is given pride of place on the right hand wall, to allow the space to stand back and study it at a distance. Here are the grand, gracious Palazzos with their arched windows, in subtle shades of terracotta, sand, daffodil and cream. Spot the Peggy Guggenheim museum in the centre, and the domes and spires of distant churches. The dappled water shimmers in the soft light before dusk. This large painting took three months, on and off, to complete and it was only just last week when Jamie added a final glaze to the lower right corner to create a soft shadow, which is most effective to draw the viewer’s eye upwards and along the narrowing length of the Canal. 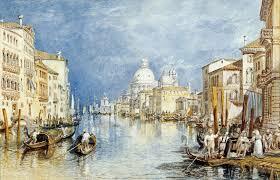 Painters have flocked to Venice over the centuries to capture the mesmerising. poetic beauty of this island city – not least the classic works by Canaletto, Belotto and Turner. But from a contemporary perspective, Primrose brings a refreshing, pure, impressionistic view of this famous scene. With a touch of artistic licence, the Grand Canal is devoid of vaparettos, boats and barges, to show the tranquility and timeless, magical sense of place. 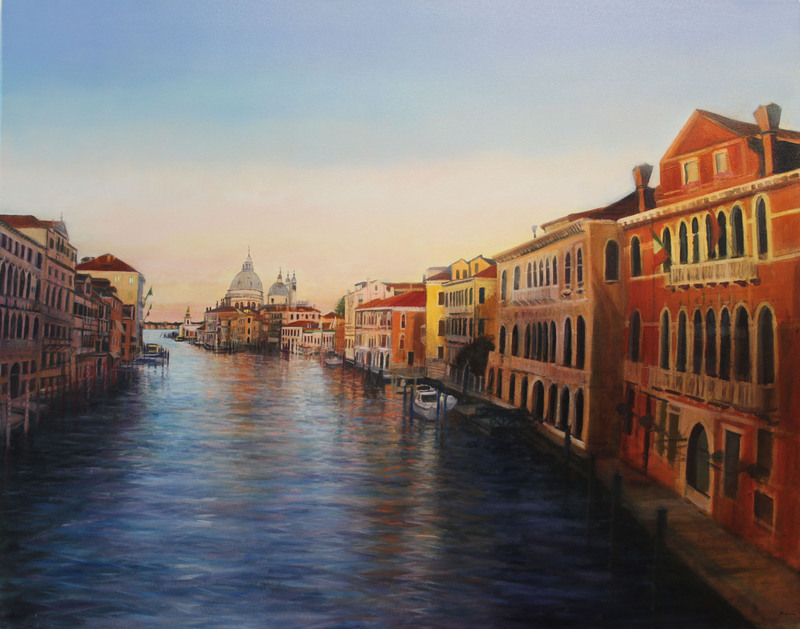 Other Venetian scenes show the Rialto Bridge, the Campanile di San Marco and a row of gondolas at sunrise. Around the Gallery, continuing on south we reach the Cote d’Azur which as the name implies, here is the clear azure, turquoise water of the French Riviera – Nice, Eze, Villefranche, St Paul de Vence and on to Provence with verdant vineyards and fields of purple lavender. As well as original oil paintings, there is also a selection of Limited Edition Prints, (framed and unframed), made to order using fine quality parchment-style German paper, manufactured by Giclee Ltd at Summerhall, Edinburgh. Having viewed Jamie Primrose’s work over the past decade, “Tranquil Destinations” is a most impressive exhibition and clearly demonstrates his creative, crafted development as an accomplished and mature artist. 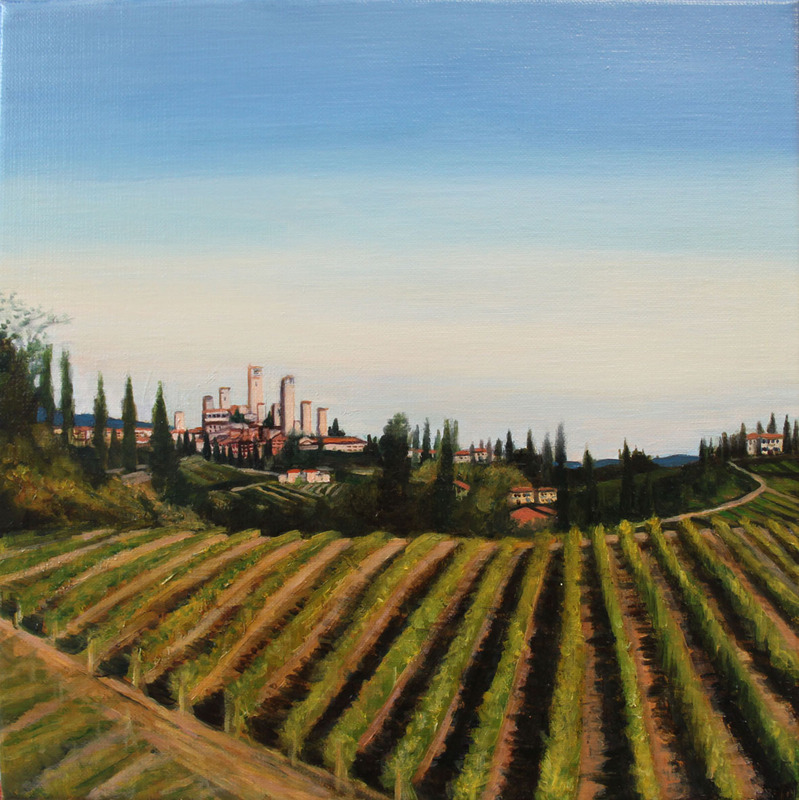 Visit the Dundas Street Gallery this week to experience an evocative “voyage” around France and Italy (with a side trip to London), as observed in this superb collection of modern masterpieces. Canaletto, eat your heart out!